T-shirts available to order: £5 or less if you choose one with wording about Touchwood! State small, medium or large, sorry you must take responsibility for ordering the correct size, they tend to be generous. I wear medium, which I estimate would be large for a size 12, and smallish on a size 16. Extra large is very large indeed (I can wear it over a t-shirt, fleece jumper & coat!!) and costs £1 more. Allow a good month for printing and delivery. UK package and posting £2 for 1, £3 for more (as many as you want). Customise: choose your own design. Add your own wording for £2 more! Like the idea, but not these actual pictures? 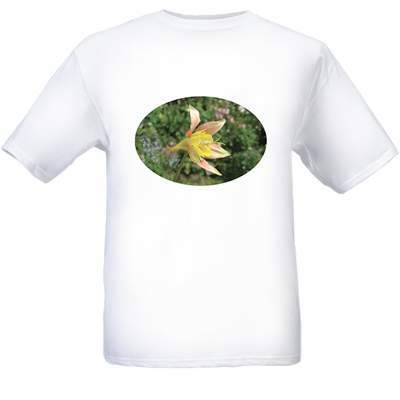 Want an extra special present for someone....a T-shirt with a packet of the seeds that matches? That's OK! Choose any of my other photos. If I look at the original and find that the photo quality is good enough, then I will design the photo and send you a small copy via email. If you like it, you order it......but it will cost an extra £1.50, or £3 with your own wording. NB, I usually do oval pictures on the T-shirt...but you may decide on a rectangular form, ask at the start please. If YOU supply the photo (I'll let you know the best size to use) then the cost is only £4. Interested? email me with any questions....as there's no returns available and you want to be sure it's what you want. Why no returns? I order each one individually from the manufacturer......with that stipulation for myself, so I'm just passing on that liability! Copyright Carrie Thomas 2008. All rights reserved.